Matsoso’s art is an enigmatic one, an art imbued with presence that frequently makes no obvious literal statement. Matsoso is also a painter and graphic artist and since c.1973 has also produced drawings in colour, although he is best known for his monochromatic drawings from the early 1970s. Typically these consist of finely drawn figures stripped of superfluous details and offset against blank backgrounds. There is an emphasis on form which assumes an almost sculptural presence. Frequently, as with these three examples in the Campbell Smith Collection (plates 214–216), the figures overlap, taking on a composite character, their hybrid nature suggesting a synthesis of opposing or contrasting, archetypal elements (man/beast, man/woman, mother/child). A graphic sensibility expresses itself through linear precision and tonal contrast with the latter reinforcing the sense of opposing elements unified and embodied within the whole. Accordingly these works could be interpreted as referring to external conflict and reconciliation between opposing forces, as well as the internalization or embodiment of these contestations within the human form. Although drawing was a favoured medium for several black artists of the period, partially due to its relative accessibility, Matsoso’s technique and temperament set his art apart from the more expressionistic works of contemporaries such as Dumile Feni (qv.) and Julian Motau (qv. ), as well as the existential mindscapes of Fikile Magadlela. He is perhaps closest to Ezrom Legae (qv.) and Sydney Kumalo (qv. ), both of whom taught him, although Matsoso unmistakably possesses a distinct style. A rising star in the era preceding the cultural boycott, Matsoso was associated with the Goodman Gallery (where he exhibited between 1970 and 1988) and represented South Africa at the Sao Paulo Biennale in 1973 and 1979. He was also invited by the Department of National Education in 1981 to submit work for the controversial Valparaiso Biennial in Chile, although the content of his work was subsequently rejected as being politically unsuitable. His graphic sensibilities led him to his employment by the SABC for a few years in the early 1980s. Regrettably Matsoso’s profile has declined, although he continues to make art. Born,/b> Soweto, 1949. Training 1962–1970: Jubilee Art Centre, with Cecil Skotnes (qv.) and Sydney Kumalo (qv.). 1972: Bill Ainslie Studios, Johannesburg. Exhibitions 1970 and 1971: Solo Exhibitions, Goodman Gallery, Johannesburg. 1972–1988: Participation in several group exhibitions in South Africa, including Tributaries (1985) and The Neglected Tradition (1988). 1971––1979: Participation in international exhibitions in the UK, Brazil, Greece, Australia, Switzerland and West Germany. Collections Absa Bank Collection; Killie Campbell Collections, Durban; Johannesburg Art Gallery; Pretoria Art Museum; State Theatre, Pretoria; De Beers Centenary Art Gallery, University of Fort Hare; University of South Africa, Pretoria; University of Stellenbosch; University of the Witswatersrand Galleries; Iziko South African National Gallery, Cape Town. Awards 1972: First prize, UTA Pavement Artists Competition, Hyde Park Shopping Centre, Johannesburg (won a trip to Paris). 1973: Special Prize for Drawing, Sao Paulo Biennale. 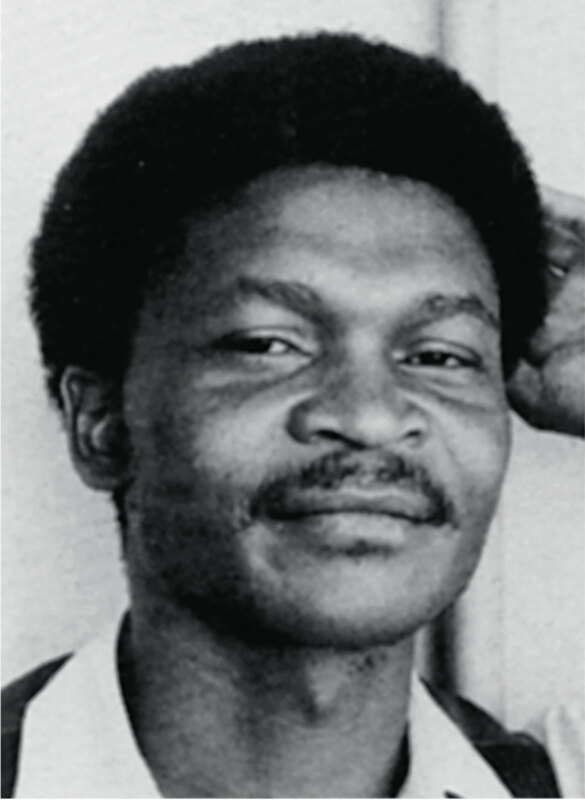 Photograph of Leonard Matsoso Source: Ricky Burnett (ed.). 1985. Tributaries: A view of Contemporary South African Art. BMW Communication Department, SA. p. 59. Reference has already been made to the fact that figures and forms overlap in the work of Matsoso, forming a synthesis of opposing archetypes, such as man-woman and man-beast (See ReVisions, pp. 234-237). Heaven help us all (plate 37) is a new addition to the Collection that is similar in scale to the other three works by Matsoso, but seemingly more bizarre in its suggestive content. Rather than the usual use of ‘opposing’ archtetypes, here we have the fusion of two human forms that do not establish any sense of separateness other than a mingling of lighter and darker forms. Their arms seem to be joined by manacles, which would make this work a pre-1976 political statement. This drawing could be a statement on the dilemma of white and black in South Africa, bound in their shared fate and future. David Hammond-Tooke. 1993. The Roots of Black South Africa. Jonathan Ball Publishers, Johannesburg. p.132-3.